Examples of Qik being used to illustrate its current educational value or potential value? How could Qik be used within an educational or learning situation? How does Qik work? What does one have to do to start using Qik? How is Qik related to other applications? What are some international applications of Qik? What are some unique ways of using Qik? What is the purpose of Qik? If you experience problems in registering for the Qik application, send an email to support@qik.com. Qik employees are on stand-by to answer any questions. There are many good ideas and ways to use Qik which set Qik apart from other applications. Qik is not only great because of the awesome technology that lies behind the application, but also because of the variety of ways in which people can use it to enhance aspects of their daily life. Here are some unique ways of using Qik. Not all of these ideas and uses may apply to you, but these may assist you to discover even more applications for this amazing technology. Qik has a special section on their website for events. 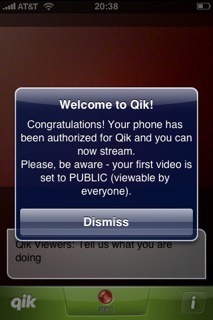 Users and Qik post events and users stream their live Qiks in order that the world can witness the event also. One event on Qik was Obama's Inauguration 2009. For this 4 day event, Qik partnered with BBC, The Houston Chronicle and CBS and asked Qik users to post videos showing their experiences at the inauguration and their thoughts on the new Obama Administration. Thirty-five users responded with 190 videos, which have received over 35,000 views. V. How Is Qik Related to Other Applications? Qik has begun integration with other web 2.0 applications, enhancing its popularity. This is important for Qik users, because now Qik is even more fun to use. Your live videos can be seen by numerous people. In short, Mogulus is a live, broadcast application on the internet with a browser of its' own, which people can form live, scheduled, and on-demand internet television to share anywhere on the world wide web. Qik and Mogulus are partners. Qik can stream live videos to this broadcast application, thus sharing with anyone having a Mogulus account. The relationship between these two partners is best exemplified through the words of Mogulus' CEO. The Qik video streaming is compatible with almost every blogging site. Other sites that that are able to stream live are 12 seconds, Blogger, Tumblr, and Wordpress. Some other sites for sharing the already streamed videos are Technorati, Del.icio.us, Stumble It!, Digg It, and Wordpress. Here are several instructional activities that can be implemented within elementary, secondary, post secondary, and the business/industry realms. The lesson plans are given in a brief form. To view a more detailed version of the lesson plan, a 2003 Word Document and a PDF File are available below each brief lesson plan. Please feel free to click on the links to view the detailed versions. Here is a lesson plan for science for 1st grade involving a scientist from the American Museum of Natural History in Chicago in a Qik video explaining and describing different types of dinosaurs. Here is a lesson plan for kindergarten where students watch Qik videos relating to different themes about seasons and then doing an activity to show what they have learned. Here is a lesson plan for 6th grade about cultural awareness. The activity involved students creating Qik videos about different cultures and then sharing them with each other, teaching them about cultural awareness, respect, and appreciation. Here is a lesson plan for 11th or 12th grade that involves a Qik video about Hispanic artist Maria Elena followed by a class discussion. Here is a lesson plan for 11th or 12th grade about video journalism where students learn about video journalism and then use Qik to make a broadcast. Here is a lesson plan for 12th grade and students who are looking into higher education for careers. Students will interview people in occupations that they are interested using Qik to make a video of the interview that they will then share with each other in class. Here is a lesson plan for college science majors involving a class discussion after viewing Qik videos regarding cloning. Here is a lesson plan for college science majors. Students will use Qik and the "live chat" feature to learn about DNA and have a class discussion. Here is a lesson plan for college science majors. Students learn about evolution and how to spot signs of evolution. They will then use Qik to record their findings. Here is a way to use Qik to communicate in a business presentation with people who may not be in the room. Here is a way for a realtor to use Qik to show potential buyers a house that may be located far away from where they currently live. Here is a way to use Qik in an interview process. Some of the other uses that have been brought up in the online educational community have to do with online learning. Some of the smaller schools that are just beginning to offer online classes do not necessarily have the ability to allow their students to remotely connect into the classroom via a web phone. One of the aspects being talked about in some of the online education blogs discuss allowing students to address questions to their teacher while they are watching a presentation, even though the presentation may not necessarily be streaming live. This would then enable the students to collaborate with the teacher with their cell phone and a website, rather than having to write an email. This could be especially helpful if the online class is something technical, such as teaching excel or some other program that requires code. This would allow the student to actually show the teacher an error message or what they were talking about, rather than trying to explain with words. Because of Qik's capacity to reach and interact with an audience worldwide, there are many examples of this technology being used in a variety of international settings. Qik's ability to facilitate individual expression and the ease that people have in broadcasting their thoughts and opinions online has had both positive and negative reactions from different countries. Rebecca King, Rory Mather, and Dirk Martil, from Australia, have made a YouTube video adreessing international purposes. You may view this YouTube video at http://www.youtube.com/watch?v=GzfUN2z3h1c. Qik's popularity has greatly increased in this country after Prime Minister Lee Hsien Loong demonstrated the technology on his Nokia phone during his address at the National Day Rally in 2008. In his speech, the prime minister praised Qik and assured the crowd that the Singapore government has been, and will continue to interact with citizens through this new media on the internet. Through his use of Qik to record the crowd and part of his speech, Lee Hsien Loong was able to share his thoughts not only with citizens in Singapore, but with an international audience as well. This also brings Qik into prominence within the political sphere. Download the brochure that was handed out during the presentation and view a PowerPoint that covers the material presented in the Qik presentation. The brochure is available as a Windows Publisher document and a PDF file. The PowerPoint is available as a PowerPoint document and a PDF file. Hi, this is Ethan Gastineau, your project manager. I am technically in the school of science majoring in biology/premed, but I am in the process of switching majors to social studies education. I would like to welcome our International Partners from Australia. I am sure it will be a pleasure working with them. If our International Partners from Australia could post a comment on here just introduce yourselves, that would be great. Thanks. Here are the jobs that you can choose from. Remember, everyone should have primary and secondary jobs. If you have any other ideas of different jobs that should be included, please share. Hi everyone. Please be looking on here constantly because I will be using this as a way to send information to you. Our assignment this week is to put background information on our research page. I know everyone will eventually have specific jobs, but we all must do this. We are each required 3 posts from 3 different sources. Try to make each post cover a different aspect of the application and please site any sources you use. We are looking for information about people's opinions of the application, how it's used, who uses it, etc. For Purdue students, if you go to blackboard and look at the assessment guide for project 2, you can see the list of questions that we must answer. There won't be a lot of "scholarly" information out there because it's too new. So anything we can find will help. I have created a Qik Research page, which is located in the above tab called "children." That is where you will put your 3 posts. Thanks! I just thought I'd write a quick post to introduce myself. My name is Bec King and I'm a 3rd year education student at the University of Southern Queensland, Australia. I'm double majoring in Music and Science and hopefully I'll be teaching in those areas in a few years. I'm looking forward to hearing more about you all and working with you on the project! Hi! I'm Sam Riehle. My major is Consumer and Family Science Education at Purdue University. Hopefully I will be able to graduate in 2 years! I can't wait to teach Consumer and Family Science. I'm looking forward to working with everyone! So yeah, I'm Bethanny Hohman and I'm a first year student, at Purdue University, and I'm studying to become an art teacher and hopefully I can set it up to be a Spanish teacher as well. Any who I'm hoping we can all work really well together! Looking forward to working with you all! I hope your weekend was as splendid as mine. I am a junior and I was majoring in Agriculture Education but Friday before spring break I switched back to the Department of Forestry and Natural Resources, but I am still completely pumped about EDCI 270 and this project! GUESS WHATT!!!! I have recieved news from the company, Qik, and they have given us the rights to use their logo. I am asking them many other questions as well. They are sending me slides on how Qik has been used educationally. This is amazing. My name is Dirk Martil, I am at the University of Southern Queensland, Toowoomba, Australia. I am studying secondry, and majoring in Geography. I look forward to working with you all. Thanks for working with the wiki. I know you having problems accessing it. Thanks for your time and effort. I greatly appreciate it. Everyone, we must start to put information in those pages that I create for the questions that are going to make up our wiki. I have put some information on the "how to get started using it" page. Keep up the good work. My name is Mohamed Abdelwahab, I graduated from college of Veterinary medicine from Benha University. I had my PhD from Purdue University in Veterinary Virology. I am very interested in Educational Technology for improve teaching. Thank you everyone for researching these questions and writing them. I have seen some other groups that do not have this amount done on the wiki as we do. They will be hurting and we will be relaxing as they are taking the final exam!!! Keep working hard, I greatly appreciate all of your help. Yes, the Australians are working diligently for this wiki as we are sleeping during the night. They have not posted their information yet, so please be patient as they will post it within the next day. Don't forget, our rough draft of the wiki is due on sunday by 10:00 pm. I strongly encourage you to use this wiki to have online discussions with each other. You can suggest ideas to other group members or ask for help. Please use it, as it is a great tool. Thank you everybody once again for stepping up to the plate. Just two more weeks and this project will be completed. I am WangDandan,from Beijing Normal Unversity,Beijing,China.I am majoring in Media Literacy,and looking forward to working with you all. This is actually a Purdue University education class project. As much as we would love to work with you, we have been assigned specific international partners to work with. If someone has assigned you to our group, please let us know but as of now we are only aware of Australian international partners. Hey group 33 here is your peer evaluation from group 35. I liked the section headings and the visual appeal. The pictures and images were very engaging and brought attention to the text. The sections were well put together and had lots of good information. I really liked how organized the page is. The tables for the lesson plans definitely help with organization and appearance. I thought that this chapter was excellent at showing how to use the application and how easy it is to navigate. I thought the pictures added were fantastic. Very visually appealing and informative. The pictures seemed to help understanding. I think it was a little too short, there mite not have been enough information, but overall I think it was good and there were not many errors. The only weakness I found was a few typos. Maybe some more color and not so many lists (i.e. what the application is compatible to.) I personally didn't like the gigantic list of phones however informative maybe a different format for the phone list. The history and development was more about the founder's personal history, which does nothing to advance my knowledge of the application. The list of phones was boring and uninteresting. Graphics or better organization (a table) could help with this.